Last week three of the biggest tech companies in the world reported quarterly earnings. Many expected Microsoft Corporation (NASDAQ:MSFT) to report dismal earnings as the PC market suffers a rapid deterioration, but the company managed to grow both revenue and earnings. Google Inc (NASDAQ:GOOG) reported even faster growth, and the stock of both companies surged. International Business Machines Corp. (NYSE:IBM), however, wasn’t so lucky. The company reported declining revenue and profit, causing the stock to severely slump. What do these earnings mean for these three companies? Going into earnings many people were expecting bad news from Microsoft. Windows 8, the recently released update of the Windows operating system, has thus far been unable to reverse a decline in demand for PCs. But Microsoft Corporation (NASDAQ:MSFT) was able to grow revenue by 18% year-over-year, or 8% adjusting for pre-sales. EPS grew by 20%, or 8% using the non-GAAP adjusted numbers. On the adjusted basis sales for the Windows division were flat year-over-year, not great news but not terrible news either. 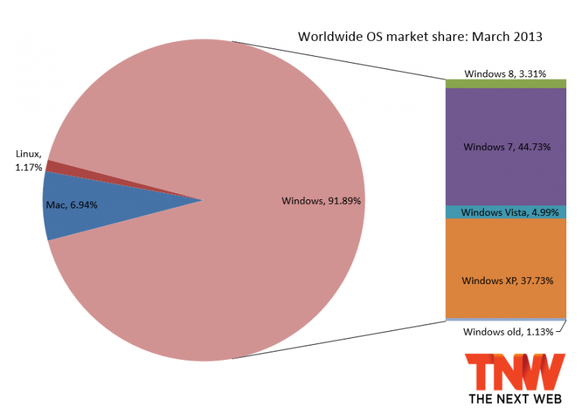 Windows 8 has been slow to gain market share as consumers are not quite sold on the new operating system. Businesses are notoriously slow to upgrade operating systems, with many still using Windows XP. However, on April 8, 2014 Microsoft will officially end support for Windows XP, meaning no more security updates and other support. This may be what gets many businesses to upgrade, either to Windows 7 or to Windows 8. Windows 8 market share has risen slower than its predecessor, but its important to remember that Windows 7 followed Windows Vista, which had a litany of problems and was universally despised. In contrast, Windows 8 follows an extremely popular operating system, giving much less incentive to upgrade immediately. Of course, Microsoft Corporation (NASDAQ:MSFT) isn’t just Windows. The business division, which includes Office, grew revenue by 5% on a adjusted basis. This quarter saw the launch of the newest version of Office, including the new cloud-based version called Office 365. Office 365 has proven fairly popular, with the company claiming a $1 billion run-rate. The server and tools division was the real stand out, with 11% revenue growth year-over-year. This division is about the same size as the Windows division, so this double-digit growth has a real impact on the company’s results. Microsoft’s net cash position has grown to about $60 billion, or $7.15 per share. In terms of free cash flow the company has recorded $20.4 billion in the first nine months of its fiscal year, about $2 billion behind last year’s pace. If that gap remains, free cash flow for the full year, which ends in June, should be about $27 billion, or $3.20 per share. Backing out the cash Microsoft currently trades at an adjusted P/FCF ratio of just 7.45 even after the post-earnings run up. A simple discounted cash flow calculation assuming 6% growth for the next 10 years and 3% growth after that yields a fair value range of $40 – $52 per share, using a discount rate of 12% and 15% to define the range. Microsoft Corporation (NASDAQ:MSFT) remains severely undervalued, by as much as 40%, and I believe that the pessimism surrounding the company is largely unfounded. Google Inc (NASDAQ:GOOG) grew its year-over-year revenue by 31% to $14 billion in the first quarter. Operating income grew by just 2.6% while net income grew by a much larger 15.8%. This discrepancy seems to be due to a much lower tax rate compared to a year ago, 7.9% compared to 18.5%. Google still derives much of its revenue from advertising but is making some big, expensive bets which could pay off in the future. Google Fiber is the fiber-based internet service which Google first introduced in Kansas City and has now announced launches in Austin, TX and Provo, UT. The service will offer speeds of 1 Gbps, much faster than the standard 10 Mbps speeds offered by other ISPs. This puts Google into competition with companies like Verizon Communications Inc. (NYSE:VZ), AT&T Inc. (NYSE:T), and Time Warner Inc (NYSE:TWX), among others. Another big project is the self-driving car. Last year the cars collectively passed the 300,000 mile mark, and so far the only accidents have been the result of human error. How long it takes for the self-driving car to become a consumer product is a big question, as legal issues and regulations will likely hold back the technology. Amazon.com, Inc. (AMZN) Is Positioning Itself Well For The Long Term Apple Inc. (AAPL), Google Inc (GOOG), And The Contrarian View Dell Inc. (DELL) and the Slump in PC Sales Microsoft Corporation (MSFT), Google Inc (GOOG), Facebook Inc (FB): Is Buying... International Business Machines Corp. (IBM), And Three Stocks “Not-to... Is Research In Motion Ltd (BBRY) A Long-Term Investment?